Colonel Thomas R. Ste. Marie is the is the 45th Space Wing Vice Commander at Patrick Air Force Base, Fla. He is responsible for the processing and launching of U.S. government and commercial satellites from Cape Canaveral Air Force Station, Fla. He serves as a Launch Decision Authority with final approval for launches on the Eastern Range, a 15-million-square-mile area which supports an average of 20 launches per year aboard various launch vehicles. He leads more than 13,000 military, DOD civilian and contractor personnel assigned to operating locations in Florida, Ascension, and Airmen deployed worldwide in support of contingency operations overseas. Colonel Ste. Marie received his commission through the United States Air Force Academy in 1996. He has since held a variety of command, staff and operations postions across the space and intelligence communities. 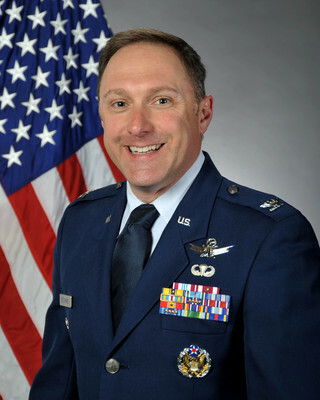 Some of these positions include: Deputy Director, National Recconnaisance Office of Space Launch, Los Angeles AFB, Calif.; Deputy Commander, 45th Operations Group, Patrick AFB, Fla.; Commander, 2d Space Operations Squadron, Schriever AFB, Colo.; Director of Operations, 1st Range Operations Squadron, Cape Canaveral AFS, Fla.; Director of Missions and Chief, Special Studies, National Reconnaisance Office ADF-East. Colonel Ste. Marie is a distinguished graduate of the Air War College, Maxwell AFB, Ala., by correspondence; the National Defense Intelligence College and Embry-Riddle University, Fla.